What happens when everyone reads the same book? Answer: They all do the same things. Reuters reports Mexico Wants Steel Dispute Ended Before New NAFTA Signed. 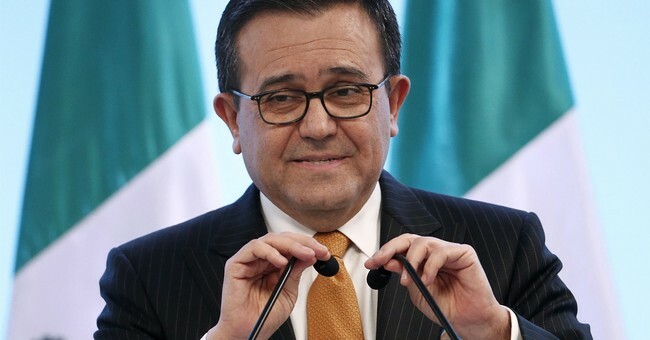 Mexico wants to end to a tariff dispute over steel and aluminum with the United States prior to signing off on a reworked trade agreement with its northern neighbor, Mexican Economy Minister Ildefonso Guajardo said on Thursday. Trump bragged about deals with the EU that only existed in Trump's head. When the EU actually agreed to Trump's proposal to end all tariffs on cars, Trump said it was not enough. When Trump bragged about a deal with Mexico, I asked "What deal?" It turns out there is no deal. Within hours of the announcement, Mexico insisted that Canada be part of the deal or it would need to rework the deal. And now Mexico has more demands. The way the game is played today is to make a deal, then make new demands while still pretending there is a deal. Don't blame Canada or Mexico. They both read the "Art of the Deal". More importantly, both Canada and Mexico are doing to Trump, what Trump did to them. We can call this whatever we want, but no one is winning from this nonsense.